1) $10,000 for a bedroom renovation is an unlikely and unachievable budget for most of us. In setting this target they can generate some great outcomes but I’ll let you know right now, the budget for the bedrooms I am ‘making over’ is $3,000 – wait for it – for three of them!!! What readers of the SheBuilds blog need to take away is, if you blow $10k on a bedroom you will not recover that investment. Your property renovation is unlikely to represent anything than a big ‘ol money pit. I’ll share some tips for making over a bedroom over at www.shebuilds.com.au that will keep you within a realistic budget. 2) The cousins! Already the stereotyping of women in property is running amok. The cushion confusion (matching my cushions to my cushions, matching my cushions to my doona cover and matching both to my floor rug #firstworldproblems) and the failure of #functionoverform in terms of both a reduced cupboard capacity and a door that didn’t close, drove me nuts. 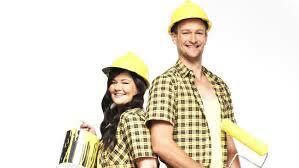 I was twitching on the couch and tweeted that I hoped to see their DIY skills sometime soon. Now I may cop some flack, not least of which from the Neale’s and Darren’s of this world though I hope Shaynna may be more on my side. Design is important but its pretty, its an after fact. A house, a home, a renovation, a bedroom need first and foremost to be structurally sound, safe and gasp #functional. But hopefully the #BlockHandbook will provide an antidote to the design folly that is expressed by the majority of women on the block. One to watch: TheSiblings #itsgoingtobecrisp! Suzanne has stepped out from behind the desk of Australia's largest home inspection business to build the skills, confidence and independence of women to tackle maintenance and home improvement projects around the home. Douglas Brown on Would you tackle a tiling job?